These verses were written about Jesus Christ, the Son of God. Jesus is the one who laid the foundation of the earth! Jesus made the heavens with his hands! Jesus is the one who is always the same and will live forever! The earth and heavens we are able to see will be folded up someday and discarded like old clothing, but Jesus will live forever. From a human perspective, I do not know if we can even begin to comprehend the magnitude of these verses. We are talking about power far beyond any human imagination. We are talking about Son Power. The same Son Power that is at work in the heart of the submissive believer. This is the power that is at work in our lives every day. 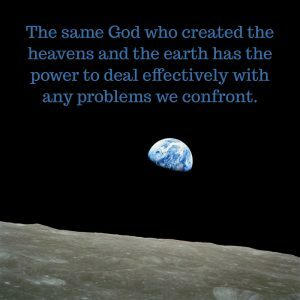 Consider this: the same God who had the power to lay the foundation of the earth and create the heavens obviously has the power to deal effectively with any problems that confront us. He knows just what is needed in our specific situation. He has the capacity to remove whatever “mountain” is disrupting our lives. We serve a God who sees each of us. We serve a God who has the answer and the power to solve each and every problem we are facing. There is no greater power than Son Power. Even Satan cannot thwart Son Power. “You belong to God, my dear children. You have already won a victory over those people, because the Spirit who lives in you is greater than the spirit who lives in the world” (1 John 4:4, NLT). Thank you, God, for showing me how great and awesome you are. You are more than capable of taking care of any problem I face. Help me to focus on your ability rather than my focusing on my inability. Son Power actively working in my life helps and delivers me to see that you are the source of power and wisdom. Help me to depend on you to navigate me through this world. Amen.